We were watching Public Morals on television last week, and one of the characters was sitting on the tub in her teeny tiny apartment, crying because she felt trapped. She was genuinely sad. The Gina of the past could 100% relate. The present day Gina isn’t sad anymore. Even though I am constantly in search of my purpose, I’m happy. I’m happy with life. I’m happy with where my kids are in their lives. I’ve become more accepting of me and who I am and that makes me happy. I’m just happy and happy is good. I have also come to look at my purpose a little different after reading Big Magic, and I think what I’m really looking for is my passion. When I went to the book signing for Big Magic the Author, Elizabeth Gilbert said, “You just have to find your passion.” I wasn’t sure how exactly to find my passion and I had wanted her to give me step-by-step instructions. That didn’t happen. I see people all around me following their passion. I have friends who are amazing singers and are always putting out records. I have friends who are passionate about dog shelters. I have friends who are passionate about yoga. I have a friend Chris, and I could easily say her passion is the Tennessee Titans football team. Rain or shine Chris is at every single home game, she goes to every season ticket holder event, I think she might have more clothes with the Titan logo on them than not. I’m surprised she doesn’t have a Titan logo tattoo. Every away game you can bet she is somewhere watching the game in full Titan garb. She counts down to football season like a little kid counts down to Christmas. That’s passion in my mind, especially if you know how badly our team has played the last few years. This week I might have accidently stumbled onto my passion. I baked a pie. 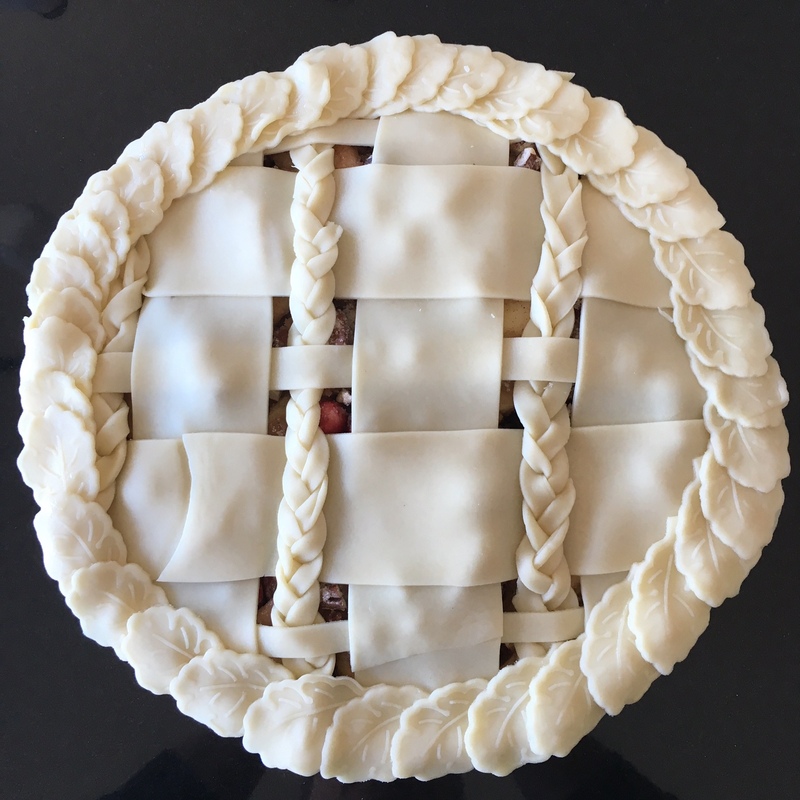 As I was doing the lattice work I realized I loved baking, really loved it. I am always thinking about something to bake. I hoard recipes and cookbooks and have for a very long time. As I was sitting on my couch on a gloomy Sunday, watching the Titan lose, it dawned on me that maybe I’ve found my passion, baking. Baking is calming to me. Baking gives me the chance to reflect. Baking makes me feel like I’m good at something. Baking makes people smile which makes me smile. Baking smells good. Baking is my passion. Baking is my purpose. I always thought that your passion involved changing the world but today I realized that wasn’t the case. You don’t have to change the world; you just have to make your part of the world a better place, a happier place. Baking just for the fun of it makes me happy and when I’m happy everyone around me is happy. Baking is who I am; I honestly think there are flour, sugar and eggs in my veins. I’m not going to change the world with an Apple Cranberry pie, but I will make the people around me fight over who was going to eat the last piece for breakfast. People will have memories of my croissants, and I know that my quiche has helped at least one person through some serious health issues. I changed my little world with my little bakery and with my recipes. I fought baking as my passion for the past year because I felt like a failure. I closed my bakery, and I felt like I had abandoned my passion. I didn’t think baking could change the world. But as I look back at my little shop, it was more than just a bakery. I touched lives, and that makes me happy. If you are happy, people around you can’t help but be happy, and maybe that’s what finding your passion is all about. This hits home for me. For a long time I didn’t think my passions were worthwhile because they were earth shattering like the things you hear on TV or read about on a blog, in a book or magazine. Traditional definitions of success shouldn’t be the hallmark that we judge whether our passion is “good enough”. If it makes us happy then it’s good enough. Enjoy your baking. The photo of that pie is beautiful. Previous Previous post: You’re Doing Just Fine. Next Next post: I Will Not Let Fear Drive The Minivan.